Late 1988 Jaime José Alves Filho, an entrepreneur from Rio de Janeiro, decided to settle in São Paulo after travelling to Italy and France searching for technology and for the most advanced materials in order to start building the best inflatable boats in Brazil. 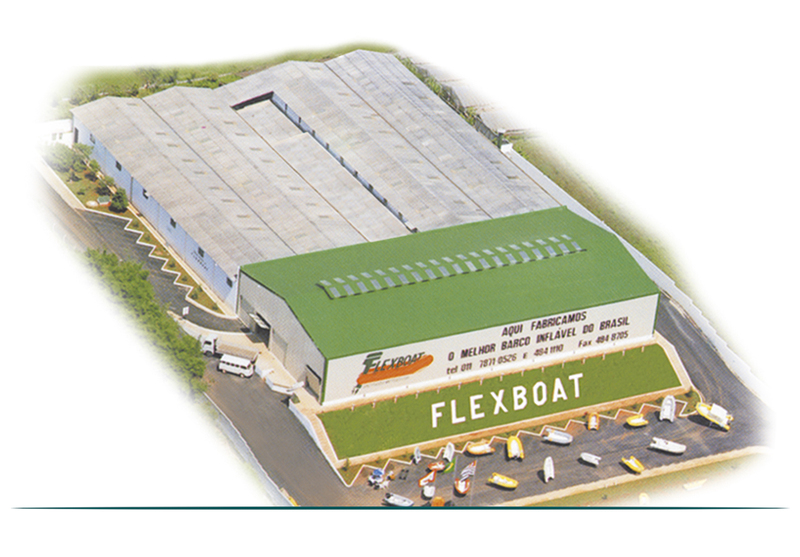 FLEXBOAT CONSTRUÇÕES NÁUTICAS LTDA. was born in 1990 in its facility located in the city of Atibaia, 40 miles from the city of São Paulo, on a 270,000 sq ft area right across the Fernão Dias Highway. The city of Atibaia was chosen due to its prime location as a transportation hub and also because it is close to the main marine markets in Brazil's south / southeast regions. Since then 28 years have demanded lots of work and dedication. During this period FLEXBOAT has created a brand name which is a reference of quality. It has turned into a synonym of inflatable boats. Since its inception FLEXBOAT has been using Hypalon (special fabric based on rubber and neoprene, imported from France) to build its tubes. This material and its incomparable features guarantee the boats will have the highest safety standard. It makes sure the boats will last longer. When used in conjunction with other high quality raw materials and components and when handled by a team of highly trained and qualified workers the final result is FLEXBOAT, the best inflatable boat made in Brazil. After starting building small inflatables up to 12 feet long Flexboat kept on expanding its product line until the release of the SR 1000, the largest (33 ft) and most advanced inflatable build in Brazil. Until now more than 15,000 boats were built and sold in Brazil, USA, Caribbean and Europe. In 2005 FLEXBOAT started the development of boats focused on military use and since then we have become the main vendor for Brazil armed forces. Federal Police, Navy, Firemen, First Responders, IBAMA and Ambient Police are among FLEXBOAT customers. FLEXBOAT is looking to the future and working onto increasing its product offering in the leisure market by offering larger boats with a cabin, and other innovations, both for the Brazilian and International markets. In the military and professional sectors, FLEXBOAT is developing a new line of products that will be second to none. This is FLEXBOAT! Top quality components and materials, highly trained professionals and great craftsmanship ensure superior quality and reliability. All FLEXBOAT boats undergo a special quality control process that guarantees a superior level of finishing. Our boats carry the tradition of a shipyard that is present in the marine market for more than 28 years.